Justin: This week we entertained my parents, the two orangutans from Sydney, Australia. It was a welcome visit as the past couple of weeks have been kinda tough for me, with homesickness, culture shock and feeling really tired every day. I needed a fresh blast from Australia. So we went up to Seoul to meet the folks. After getting from the airport we took them to a great guesthouse in the University District of Sinchon. We took them out for some very Korean meals, fried pork and galbi at a restaurant around the corner. The folks loved the open and social nature of Korea. Korea’s a fantastic environment to eat out at night, the layout of the tables and shared dishes inherently and functionally makes it more social and open. Function follows form in this case. Justin: I recall going out for dinner in Sydney and seeing so many people having a quiet dinner for two in their own little private worlds, not so in Korea. You can’t share a meal in Korea without it being heavily shared, hoarding your own meal is impossible. This aspect is most pleasing in Korea and genuinely fits in with how I envision healthy, thriving communities. Similar with exercise, where many public exercise areas are shared together, especially among the older population. Sharing is caring in Korea. Justin: The next day we went all touristy and took a day trip to some of Seoul’s famous locations by air-conditioned coach. We visited two major palaces, the first being Gyeongbokgung palace near the main boulevard of the city. 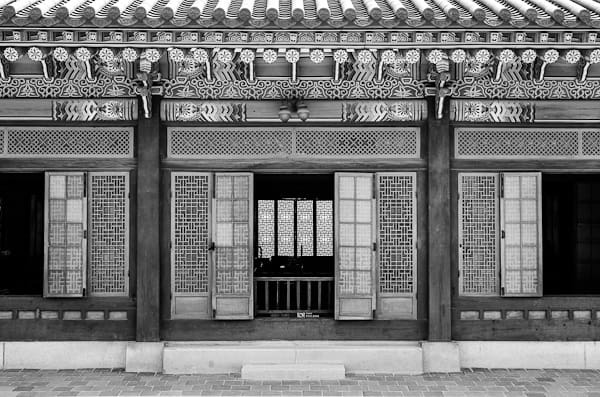 Kat: Most of the historical places in Korea were built during the Joseon Dynasty, but many of them were destroyed during the multiple Japanese occupations of Korea. It’s still an issue of contention between the two countries, with old Japanese occupation buildings remaining in the city. But thankfully some of these historical sites survived and were able to be restored to the quality of UNESCO world heritage sites. The palace featured some incredible pagodas and buildings over lakes full of lily pads. Justin: We caught the changing of the guard, a court custom not to be missed. It’s an amazing transition taking 15 minutes and occurring on the hour. Kat as usual got some sensational shots of this ceremony. Kat: I felt sorry for some of the guards having to wear such large uniforms in the heat! Kat: After lunch we visited Changdeokgung Palace, an UNESCO world heritage site. Our helpful tour guide guided us through the massive palace. What struck me was how the King and Queen often led separate lives; they never slept in the same place, and the King had an entire building full of concubines. The two storey rooms were covered patterned tiles, with enormous stone pavers marking the “King’s path”. I admire Asian design, the repetitive minimalism which creates a calming atmosphere in the rooms and porches. The architecture is so original, with paper screens and intricately carved doors. The austere interiors were offset by detailed mural paintings and screens. Justin: The tour also had some blatant tie-ins with ginseng and amethyst sellers. We were ushered into a room and given a two-minute history of the product and then offered to buy any and every single variety of ginseng and amethyst known to man at very dear prices. Not sure if anyone on the tour actually considered buying anything as it felt way too corporate and heavy on the sales pitch. Kat: And ginseng tastes disgusting, no matter how “good” it is for you. Kat: With a heat wave riding through Seoul these past two weeks, on the second day we hit up COEX Mall to escape the weather. Justin bought out UNI QLO, discovering some David Lynch and Beatles T-shirts to keep up his cool teacher style. The mall has a Kimchi Museum inside – kimchi is not just a food in Korea, it’s a matter of national pride. According to Koreans, Kimchi has the power to make you thin, protect you from cancer and keep your cholesterol down. According to me, it’s fermented cabbage in chilli sauce. There are more than 100 varieties of kimchi. The museum even has a tasting room, where you can try out some different types of the spicy side dish. For 3000 won it’s a fun way to learn about a very weird food, with signs in English and Korean. Kat: What better way to end our Seoul vacation than visit N Seoul Tower to get some great city panoramas? 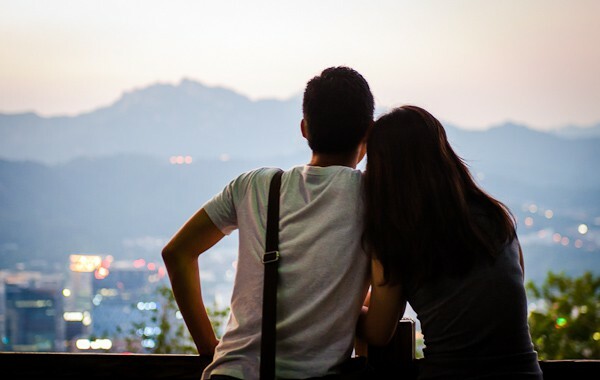 The top of the mountain was crowded with romantic couples. It’s a pretty nice date spot, the fences layered with love locks and couples holding hands. Of course, in Korea public displays of affection are a big no-no… so holding hands is about as romantic as it gets. We ate dinner at a delicious Chinese restaurant, and I tried iced-soup, which was a huge refreshment on such a hot day.